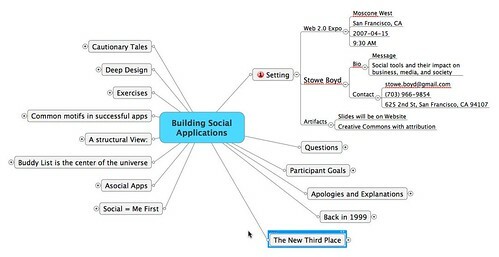 I really enjoyed Stowe Boyd’s 3 hour workshop at the Web 2.0 Expo yesterday AM on ‘Building Social Applications‘. He really helped me get my head around some of the foundations of designing these next generation online social experiences. Took notes in MindManger — here’s the .PDF or the .MMAP files. 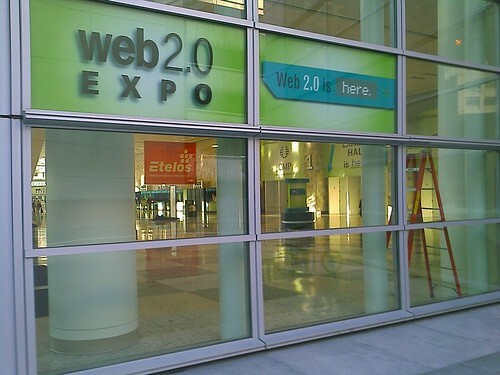 I am at the Web 2.0 Expo at Moscone West in San Francisco this AM. Got here early to scope out the power and do a Sightspeed video call with Jen, Thomas, and Ruthie back in Seattle. If you are here for the conference, shoot me a note or twitter me (bryanzug) and let’s hang out. Am looking forward to Stowe Boyd’s 3 hour workshop this AM on ‘Building Social Applications‘. I hear he know his $#!7. Also — the first Ignite session outside of Seattle is happening tonight at the Expo. Brady has put together an excellent lineup — including Justin.tv — should be interesting. Over the last few months I’ve found myself trying to explain the deepening (and real community) aspects of meatspace interactions that my wife Jen and I have been drawn into as a result of participating in online community. Usually we are trying to explain to business colleagues or friends or family or members of our church that, yes, indeed — online community is a part of real community and not the equivalent of social cheese-whiz that some describe it to be. But, yeah — as I’m working to explain it I often see eyes begin to glaze over — and I can tell that folks are either not buying it or I’m not communicating very well. Which leaves me — searching for ways to compellingly relate how online community has become real community for us — looking for the stories and patterns that engage both the emotion and the intellect. This morning I read her post from yesterday describing her keynote at SXSW. The post is called Face-to-Face Trumps Twitter, Blogs, Podcasts, Video… and is full of great passages on how all this social web software drives a deeper desire for face-to-face community. …all our globally-connecting-social-networking tools are making face-to-face more, not less desirable. Thanks to the tools y’all are building, we now have more far-flung friends–including people we’ve never met f2f–than ever before. We now have more people we want to connect with in the human world, often after years of electronic-only contact. Nice insight — sticking that pattern in my bag of tricks — something tells me the “online community isn’t real community, is it?” questions aren’t gonna stop anytime soon — this stuff is continuing to disrupt everything. Did I mention that my mom who just got her first computer for Christmas is now IM’ing all the time — the world really is getting flat. I’m in the process of uploading video I shot at Mind Camp 3.0 here in Seattle last weekend. So far I’ve uploaded two video files from the ‘Discovery Slam‘ that Scott Berkun and I hosted. Intros — these will be up sometime next week — had to shoot those to tape and they will require a bit more turnaround time. Will let you all know when these are ready. Some caveats — full sessions are raw footage, so you may have to forward a minute or so at the beginning — also was playing around with shooting straight to disk in a web ready format for super quick turnaround on these sessions, so the video is a little bit too compressed for my taste — will be switching codecs/formats a little next time around. Also — catching discussion audio is hard because nobody likes to use a mic — but things seem audible for the most part in the discussion sessions I shot — please let me know what you think once they are posted. Here’s the flash video version of my screencast on installing WordPress via Dreamhost. Enjoy! 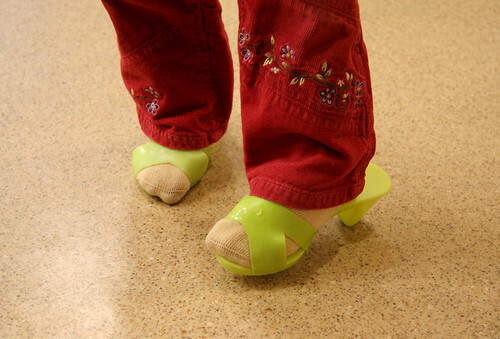 In the quest for user attention, blogs and screencasts are more that buzzwords. Join us as we examine how these technologies help organizations capture valuable elements of “watercooler conversations” and leverage them toward system and process training. Session will include: An introduction to blogs, screencasts, and RSS; An examination of why content produced and distributed with these methodologies is naturally interesting to users; A short tour of WordPress and Camtasia — two popular blog and screencasting tools. Berkun has a great writeup of his FooCamp experience from last weekend. Sounds like a great time. I’m guessing fewer sessions were recorded or taped this year. I don’t know why, but the vibe was much less about blogging, posting and publishing in real-time than last year. Maybe this is not a lowlight – not sure. Seems to me that this is both a highlight and a lowlight. In one sense, people are more focused on engaging with the stuff around them –– the facilitator, the content, the people, the space. That’s a big win in my book as the ‘must blog’ buzz is subsiding in favor of more human lids down engagement (laptops, not eyes). On the other hand, having just done a full weekend of session video capture at BarCamp Vancouver, it’s a lowlight to me that so many great conversations that could have been captured and passed on just won’t. In a sense, our ‘now’ orientation keeps us from seeing the connections that are waiting to happen outside of the room/people/time of a particular setting like this. And yet, when things get captured decently, they have great potential to take on a kind of life of their own — making connections and sparking fires that we can’t see in the moment — kind of like good literature does over the ages. Even capturing a session that is not hit-it-out-of-the-park-fantastic is fun for me because the presenter is always really grateful and will usually go back and see the things they did well and learn things they could do better next time. All the stuff, those rhetoric classes were supposed to teach you, but, because you never saw the relevance, never did. Anyway — the weekend was really useful to help me think through this participate/capture dichotomy — lots of ideas percolating on how to bridge the gap. Can’t wait for Mind Camp 3.0 to try ‘em out. Seattle Mind Camp 3.0 tickets now available! Tickets for Seattle Mind Camp 3.0 are available now — here’s the direct link to registration. They are $30 early bird price. Happening Nov 11–12 at same location as last time — the Youngstown Cultural Arts Center — very cool venue.